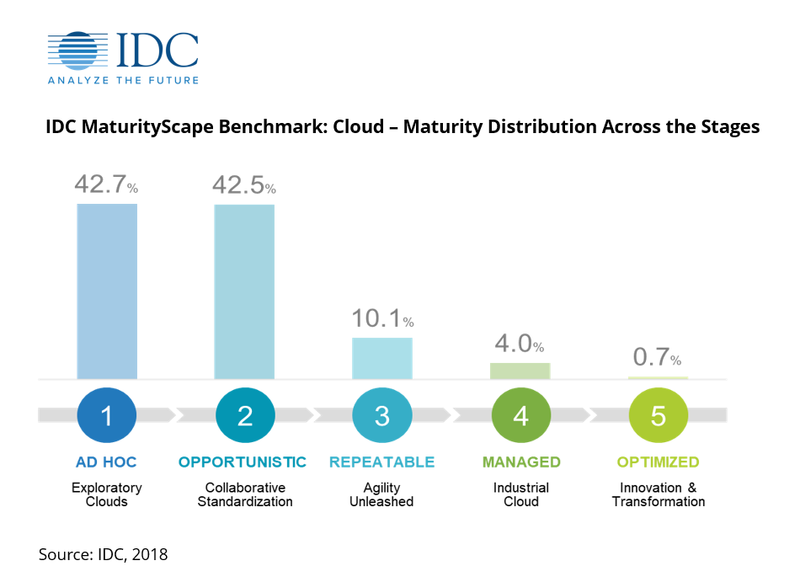 SINGAPORE, July 23rd, 2018 – IDC Asia/Pacific’s latest study titled IDC MaturityScape Benchmark: Cloud in Asia/Pacific (excluding Japan), 2018 suggests that more than 85% of the Asia/Pacific organizations are still in the early stages of maturity, which in IDCMaturityScape’s model are referred to as ad hoc and opportunistic stages. Compared to the previous Cloud MaturityScape benchmark study in 2016, over 20% of organizations has progressed from stage one (adhoc) to two (opportunistic). Less organizations are seen to have crossed over from stage two to three (repeatable), which is reflective of the difficulty in crossing the chasm between these two stages. Progressing to stage three requires significant investments in technology, tools, processes and skills – all of which take time and budget. Internal competencies and skills to support these activities are also relatively low in the region, with most of the skilled resources concentrated in large multi-national enterprises and IT service providers. Thus, organizations that leverage on externally sourced services like IT outsourcing and managed services are the ones who are able to cross this maturity chasm. This is also a key contributing factor to the maturity in cloud adoption seen in developed countries like Australia, New Zealand and Singapore. IDC believes that the technology gaps between Thrivers* and Survivors** organizations are narrowing because of the maturing technology which results in standardization of cloud services and their ease of adoption. But to progress to more advanced stages in the maturity curve, organizations must adopt a more strategic view of cloud as an enabling technology for business transformation and innovation. Faster time to value and agility is the new driver for cloud adoption. Cost of cloud adoption is rarely justified in the early stage of maturity as the adoption is primarily driven-based on required functionalities from the business. "Speed and agility has become the key drivers for cloud adoption. More organizations in Asia Pacific are adopting a cloud-first strategy such that cloud infrastructure has now become a preferred option for IT modernization," according to William Lee, Research Director, Cloud Services, IDC Asia/Pacific. "Organizations need more consistent, standardized, and available automated cloud resources to enable developers and LOB teams to execute at speed and cost. Workload portability and application delivery across multiple clouds will be key to build a robust cloud services delivery platform for agility."